From the humble beginning of “Clown Fun ’89” with 20 people registered for a one day workshop in a Red Deer Alberta school, the “ClownFun” convention has grown in leaps and bounds into the amazing event that many a clown and clown to be (first of May’s) anticipate with great excitement every year. Over the past several years over 1000 clowns have registered and attended “ClownFun”. Some registrants have attended every one!! The first 5 years succeeded thanks to time donated by our lecturers who gave freely of their time and knowledge for the promotion of the art of clowning. Christine Sopczak, Nancy Hampson and Ron Daley of Calgary – Buddy Salloum and Jim Price of Edmonton – Penny Jackson, Medicine Hat – Joanne Broadhead, Lethbridge – Andi and Julie Rothweiller Murrieta of California. These people are the real foundation of “Clown Fun”;. Our list of lecturers contains a spotlight in the ring of the who’s who in clowning: Angel Ocasio, Karen Bell, Brenda Marshall, Ewe Krohn and Carole, Andi and Julie Rothweiller Murrieta, Eugenio “Chagy” Adorno Mark Renfro, David Ginn, Lori Hurley…. 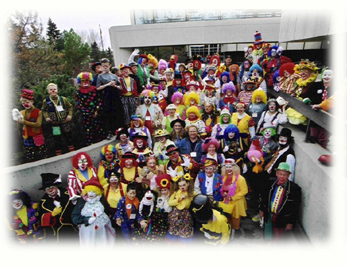 not to mention the great non-clown lecturers who are experts in thier fields like juggling, balloon artistry, magic etc…..
“ClownFun” moved to Calgary in 1996 where it is still held today – growing and improving every year. Fun Camp Canada has become an event NOT to be missed! !